A rant: open or closed, you get what you pay for. 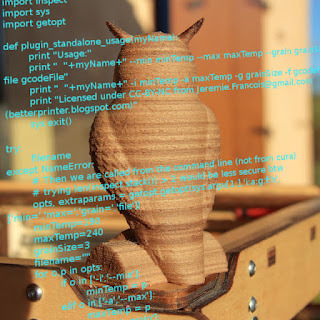 I got "stimulated" again by a feedback on my wooden patterns related to the Python script I posted on thingiverse. Very cool thing, but does anybody know how to use this with a makerbot? How can I edit the x3g file? Or an other way, how can I convert a gcode to x3g? Thanks in advance! -- j.
I have checked Markerbot own site: "Your Replicator 2X can only read files in the .x3g format". So bad for their customers: they just do not care about the decade-old standard gcode format that all other players support in the field ! Thinking about it for a while, I must say I will not help at all in this respect. Let me say why. Help yourself: compatible 3D printer parts that are easier to swap! Why would I ever re-design a working part of a printer? Most of customers and users do not tinker with their 3D printer. After all they paid for a robust printer and spent a lot of time setting it up properly. Once done, it stays so (well, at least with the Ultimaker). Sure, it is a desirable feature, especially for the "boxed/walled" frames. But it may get really annoying when you are trying printer part alternatives in the first place, which is the subject of this post. 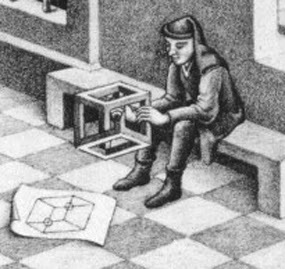 Now back to the question: why shall I sometimes just re-design a part of the printer with no added value beyond the ease of manipulation? Make it yourself: it can be better than what the industry sells you! 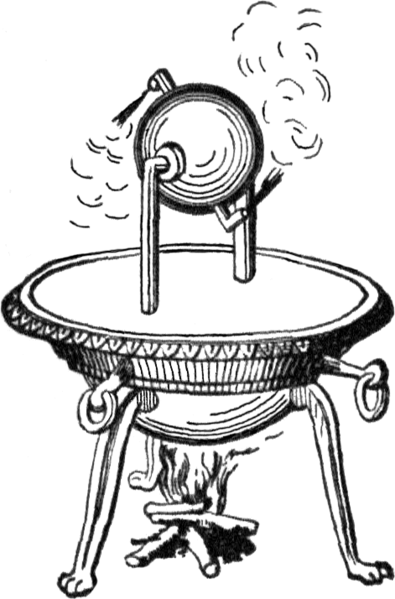 The Aeolipile, may be the first steam engine. It was certainly made "at home" by an early "maker" in Grece. we lost almost two thousand years before re-discovering it! Going "nuts" and 3D printing with a 1.0+ mm nozzle! A ridiculously big 1.1mm nozzle make it flow like hell ! After some testing with a 0.3 mm nozzle, I really had to try and post my quick and dirty tests with a huge one. Now for sure it was funny as a friend told me I just had made the first Scoubidou machine! But the first prints still were surprisingly good! Not only can I print very fa(s)t, but it still makes a nice print in the end. Now, there were a few quirks I should have taken time to fix (see below), but very big nozzles are now part of my consideration when I want to prototype quickly and/or when the printed object needs no special accuracy: refining the ergonomics of a handle, or printing a toy and so on. No slipping, no grinding: not always a good thing! 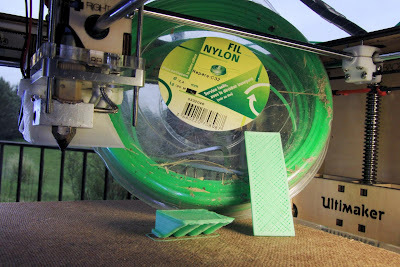 Let your filament slip, your bowden tube pop up... or break something ! excessive pressure has to "break" something anyway. When I tighten the idler completely to the maximum, the driving bolt grips the filament so well that the weakest point in the feeder mechanism becomes the PTFE bowden tube resistance itself. As you can see on the pictures, my PTFE bowden tube got stretched and stripped in the pneumatic push-fit connector! 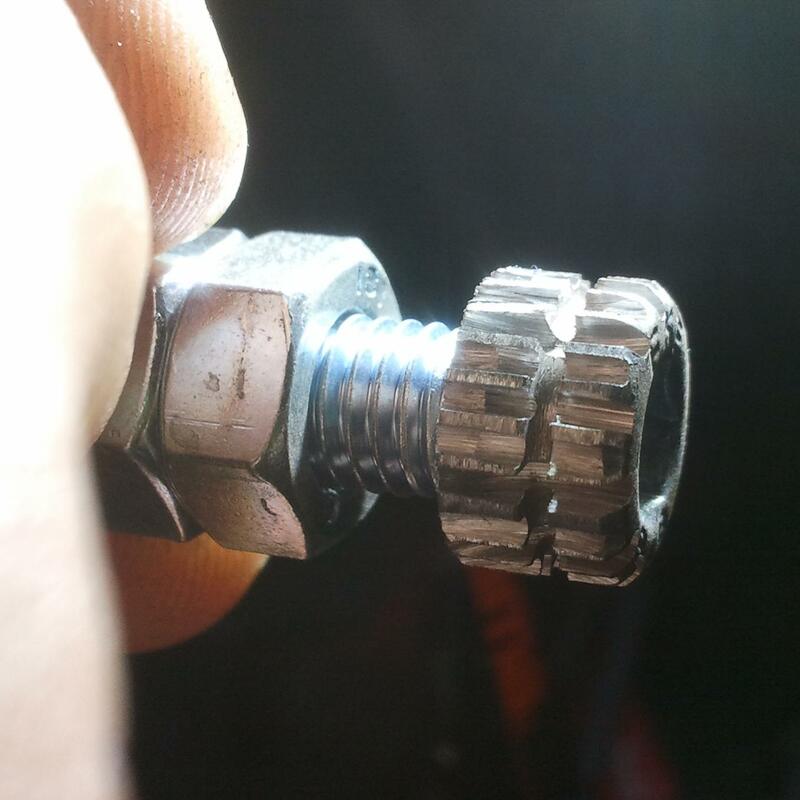 This seriously clogs the nozzle and it becomes a real drawback in the end: check my analysis below. but how tricky and troublesome it can be! Is it worth using a smaller nozzle on a 3D printer? I changed my hot end after my experiments with cheap nylon trimmer line, and it happened I had a 0.3 mm nozzle around. Was it worthwhile for even finer prints? True, you can / do get finer details... but once again, there are trade-offs. And as for me, I will still mostly use a larger nozzle for the reasons I explain below. Is filament quality so important after all? I heard years ago that trimming line was one of the many materials that was tested on a 3D printer (the biggest list is probably here). This time I tried for myself, and it was also the proper occasion to deal with how "reliable" the material has to be (note that I wrote another post more specifically on how to print it). Really, trimmer line may be a fully compatible filament ! My hot end is dying: the annoying PEEK thermal insulator started to melt (I suspect that the PID regulator overshot the temperature because of intermittent connection that I have fixed since). Still, it does not impede the flow much, so it gave me the opportunity to try some risky fun : what about this basic nylon trimmer line I got for free 10+ years ago when I purchased my gardening trimmer tool? appreciate it when they would charge $30+ for this? It is no secret by the early adopters that 3D printing at home will soon become one major copyright battle. And I sincerely hope the industry will find a better answer than that of the music majors regarding mp3 music, or they will just fail anyway. Will all the printer owners become the next pirates? 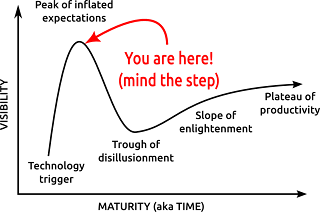 And reciprocally, will the big player violate our own creative commons copyrights (or impede innovation at the hobbyist level with they own broad patents, see my longer post on the subject)? Is there a chance that we soon get commercial repositories where we can buy, download, customize, and print Lego bricks, Barbie dolls and cheap vehicle spare parts? Or will it be the hard way with inefficient injunctions, DMCA and court battles again ? 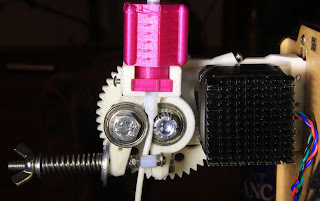 Almost one year ago I got rid of the plywood Ultimaker filament drive mechanism. It is an extremely important part of the FDM process as it pushes the (cold) filament towards the (hot) end. Any malfunction at this stage systematically leads to a bad print. So when not reliable, you have to stay close and react quickly to fix troubles, for example by feeding the filament further manually (btw check this if you are still doing it on an Ultimaker). As for me, most of the trouble came from the old bolt that was shipped with my printer: it was grinding my filaments a lot, sometimes to the point it would stop moving completely and ruin the hour-long printable kalashnikov. 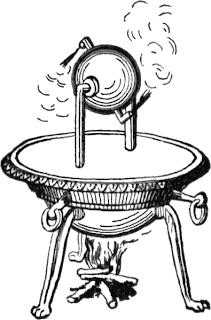 It also lacked Bertho's addition of a ball bearing on the "idler arm", which soon became part of the official design. In fact I just don't know about the new official drive mechanism (which seems way more reliable given the forum feedback), because I designed my own feeder that has to match my more efficient but unsual hobbed bolt. It suits me completely: months of intensive usage without a failure. And I learnt a lot of openscad and industrial design by the way. What cannot be 3D printed? Time to debunk some myths! 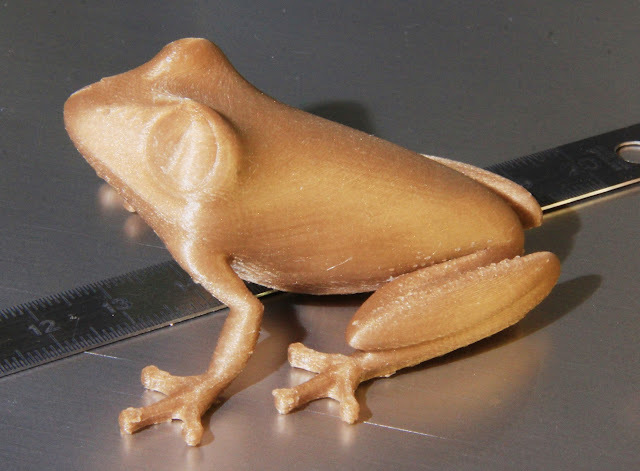 General 3D printing misinformation: review of facts and fiction! Each technology has some fundamental limitations, and 3D printing is no exception. As soon as I owned and wrote about 3D printers, people started "spamming" me with mainstream articles about it (no pun: still I like them and still I learn from them!). So even our grandparents would soon be printing their glasses, their bikes, their firearms, their houses and even their own legs! For sure, I am not the one that will disenchant this emerging technology: I am writing this blog and I regularly post new designs on Thingiverse repository. But as I write this (april 2013), you just cannot buy a 3D printer and print anything, nor even expect it to work as advertised if you do not understand very clearly how the thing works. It is just not reliable enough for the average user (unless you have no special expectation, in which case this printer may avoid frustrating experiences). It is even quite hard to reach an acceptable quality even for people born with a screwdriver in their hand. Please read on! Which hobbed bolt for a filament feeder? My homemade one! As all owners of 3D printers know, one item of utmost importance is the so-called "hobbed bolt", "knurled bolt" or "driving shaft". It is one necessary "vitamin" (ie. 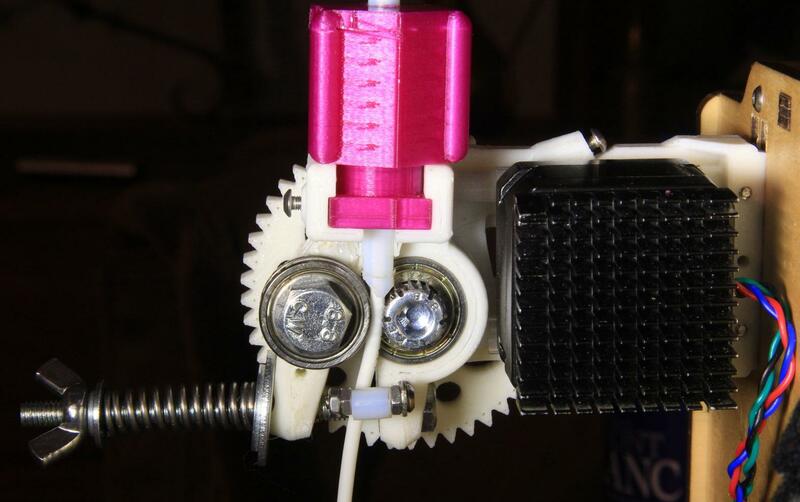 non-printable) item that is coupled to a motor and which rotation drives the filament into the hot end (check the whole setup). Now, molten plastic still does not flow easily through our tiny nozzles (~0.4 mm), and the force to be applied is quite high. Pushing the filament manually gives a good idea, as one hand is barely enough. 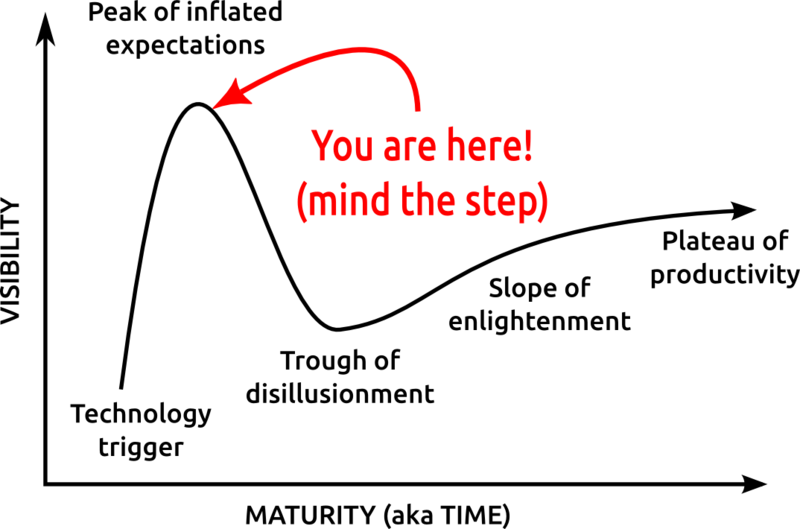 Since necessary value may be 15 or 20 Kg of traction, this is where problems start to arise given the small filament diameters (3 mm or even 1.75 mm).